I finished the run but was completly beat at the end. It took all day to recover, my legs felt like crap and I was completly worn out. My hams were really tight and aching after the run. Today my hams are good but my quads are sore. Target was 20 miles @ 8:26 pace. There's no shortcut to marathon success! Sore quads, sore toe but I got it done! The first mile I felt good (energy wise) but about halfway into the second mile I started to doubt myself and started to labor. Not happy with the inconsistant times but happy I didn't quit. Repeats - 10-20 Min. Warm-up, 3 x 1600 @ 6:12 pace, 1 Min. Recovery between each, 10 Min. Cool-down. First mile too fast. Legs were still sore from 20 miler on Sunday. Toe still sore too. Way too inconsistant in the paces. "Immediately Jesus reached out his hand and caught him. "You of little faith," he said, "why did you doubt?"" I don't really know what to call this run since it's not part of my RLRF training program. Since I've not been able to get and cross-training in I just decided to RUN! No pace, no plan, no heart monitor, just run what felt good. I ran the flats medium, the down slopes faster and the hills slow (I guess that was the plan :-). My legs were a little sore but actually better than yesterday. Tomorrow I will run a Temp run, then have a couple of days off. I'm not sure what my running schedule will be for the next 10 days as I am leaving for The World Series Team Roping finals in Las Vegas on Thursday. It may all be treadmill runs for those days. Tempo run today. I was a little fatigued and it showed in the overall run. The third mile is mostly uphill and and you can see the effects of the fatigue in the pace. I think a couple of rest days are in order. "Someone who is busier than you is running right now." This run was good until about mile 17 when I started to get light headed and my hands began to tingle. Didn't have anything but water but may not have drank enough or maybe it was the Altitude? 8.12 @ 8:31 Avg. pace. Ran the first two miles with a friend, slow in the 9's then ran by myself for the rest. I couldn't bear to spend another $15 to get into the gym so I just ran on the streets in Las Vegas. Luckly, where we are staying, is off the strip and there are several options to run. Good run but oddly sore after the run. Only carried one 16 oz bottle of water so I probably got dehydrted. 7.52 miles @ 7:54 Avg. pace (HR 150) on the streets of Las Vegas. I'm not going to try and speed work this week since I don't have a track to run on. So, I just ran! I only took one bottle of water and started feeling dehydrated at about 6 so I stopped. I was very happy with this run as I felt strong and m HR was good. I progressed from 8:10 on the first mile down to 7:33. 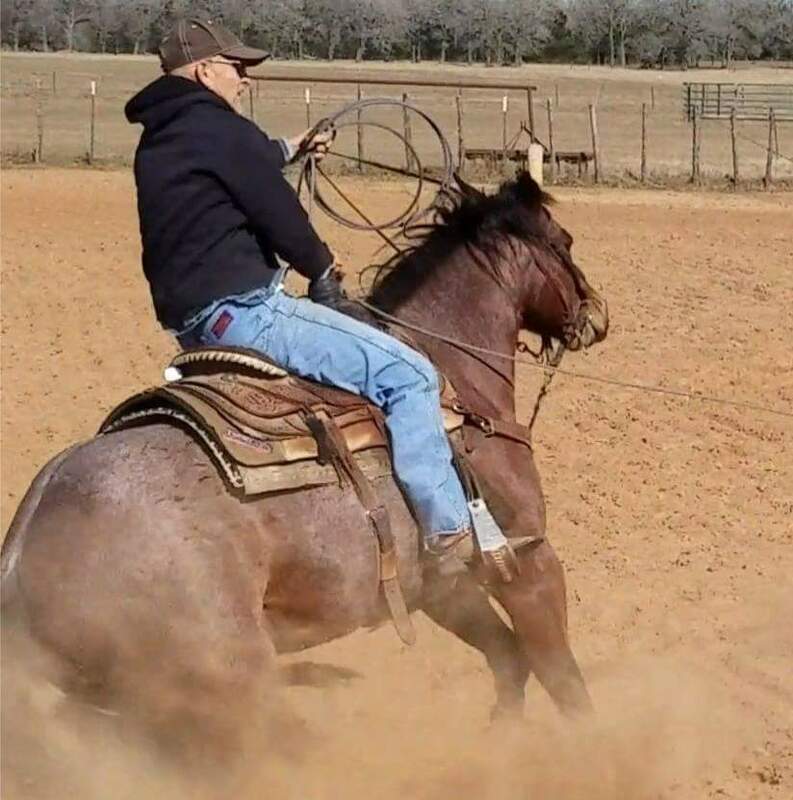 I completed the first rounds of roping competition. Had a little mishap and didn't make it back to the finals for the big prize money but I did win a Rotation which paid $6,000 per team ($3K each). Not bad but not as good as one always hopes. Thursday starts the final event. Hopefully I can finish strong. I won big in this final event last year! 8.5 Miles @ 7:57 Avg. Pace. Not sure why but my HR monitor gave some odd readouts. It may be since the humidity is so low there wasn't enough sweat to allow for a good reading between my chest and the monitor...? Back from Las Vegas with just a little money in my pocket. I won a "Fast Time" in one Roatation which paid $ 3,000 ($ 6,000 for the team). This got a lot of my entry fees back so I'm happy to win this. Had one mishap that kept me from making it into the big finals. I slipped a horn on one steer to keep us from being high call back in the big finals. Now it's time to start a new year and qualify again for next year's finals. They are just too good to miss. I wasn't feeling to good this morning so I decided to only run 10 miles. I seemed to have a cold or sinus infection that is really dragging me down. Weather - 61 degrees, light rain. Note: I was really tired from the trip from Las Vegas and I have a cold or sinus infection. Running short on time so I didn't attempte an 18 mile run. Back to the RLRF program although I ran what I missed last week instead of this weeks schedule. I'm still feeling really crummy but Callie (my daughter) is in town and so she went and ran with me. I don't think I would have done this without her being here. I was supprised I actually kept the paces. I actually was much better this time than the last training cycle (3:46 Avg. 165 HR). Repeats - 10-20 Min. Warm-up, 5 x 1000 @ 3:44 (5:58 pace) 400m Recovery between each, 10 Min. Cool-down. Notes: Good workout but I have a cold or sinus infection so didn't feel very well. Also, this was actually the workout I missed for week 13. Today is supposed to be a cross-training day but it's too cold to ride my bike and I didn't want to go to the gym so I simply ran slow. Target was to keep my HR below 140. Weather - 41 Degrees, 40% humidity. Well, running 4 days in a row has made me tired as shown in this run. I was schedule to run 6 tempo miles but after 5 I threw in the towel. Nothing hurts on my body and I'm not really sore, just tired. I couldn't even get my HR up to max. I think I'll rest tomorrow. Just couldn't do 6 so I stopped at 5. I think I was just tired. This was my 4th consecutive day to run. It was also hot anad humid. 21 Tell me, you who want to be under the law, are you not aware of what the law says? 22 For it is written that Abraham had two sons, one by the slave woman and the other by the free woman. 23 His son by the slave woman was born in the ordinary way; but his son by the free woman was born as the result of a promise. MLR Today, (learned that term from Slow Joe :-). One thing I noticed was how consistant my HR was throughout the run. I don't think it's ever stayed so even for so long. The 27 degree temperature may have had something to do with this. It was cold but I bundeled up pretty well and luckily I didn't really get too cold, not even my hands or feet. I have been just drinking water on all of my runs but today I just drank gatorade and took one gel during this run. When I finished the run I felt pretty good. I believe I could have run a few more miles around an 8:00 pace but I couldn't have complete a full marathon. I guess I still need some more training and conditioning! Really didn't have a specific target but would have liked to run a 7:45 pace. Main focus was to keep it somewhat comfortable for as long as possible. Ran the End of the World 5K this morning with Callie. Pace her at an 8:00 pace to win her age group. Yesterday (Monday) I did another MLR, breaking from my scheduled training program again. Things have been so hectic that I've had to improvise and Just Run but the outcome was a 58 mile week last week. The biggest I've had in a long time. The good thing is my body feels great and this MLR was better than the one at the first of the week! Probably not running today (Christmas) but hopefully I will tomorrow. The weather is supposed to get really nasty so I'm not sure, again, what I'm going to run. It was windy and cold today so I went to the gym and ran on the treadmill. I couldn't really do my scheduled workout (Track Intervals) so I just decided to make it an easy day. Ran 8 miles with the incline set at 1%. Started out slow and gently progressed until my HR was peaking above 140. It's pretty quite and boaring here at work today. Keep HR below 140, progressing up in speed. Well darn...I thought I could do better on this run than I did. I was really thinking I could run 12 @ 7:30. I knew I would slow down some on the hills but I didn't think it would be that much. Not sure what the problem was except that I couldn't keep up the effort. I've run this similar run (but 10 miles) before and averaged 7:23. On that run my HR averaged 162 but today my HR of 157 seemed too strenuous. Didn't quite hit my target. Never take advantage of any widow or orphan. If you do and they cry out to me, you can be sure that I will hear their cry. Ran from chruch (Lockhart) to home. The total distance is 23.5 miles so I walked/jogged the last 3.5 miles. I'm happy to get this run under my belt but a little worried because my kneecap, on my left knee, was hurting after the run. About 12-13 miles into the run it started hurting a little but went away after a few miles then after the run started hurting even more. Today it's not too bad and I'm hoping it goes away with some rest. I'm sure it's just overuse. Anyway, I kept the pace I wanted with a few slow downs and speed up on the hills. I was even able to give a good effort on the last mile (7:18) but as usual, after 20, I wasn't sure I could have made it to 26.2. Even the last 3.5 miles, at a slow pace, were hard. I forgot my HR monitor so I don't have that information.